Clever design for an online clock. Alan Boyle has written a thought-provoking post on so-called "killer robots". It was only eight months ago that iTunes passed Amazon to become the number three music retailer. Wal-Mart is still holding its own with a massive brick-and-mortar retail business in addition to its online music store, but must be getting nervous as iTunes continues to close in. "Diebold Accidentally Leaks Results Of 2008 Election Early". 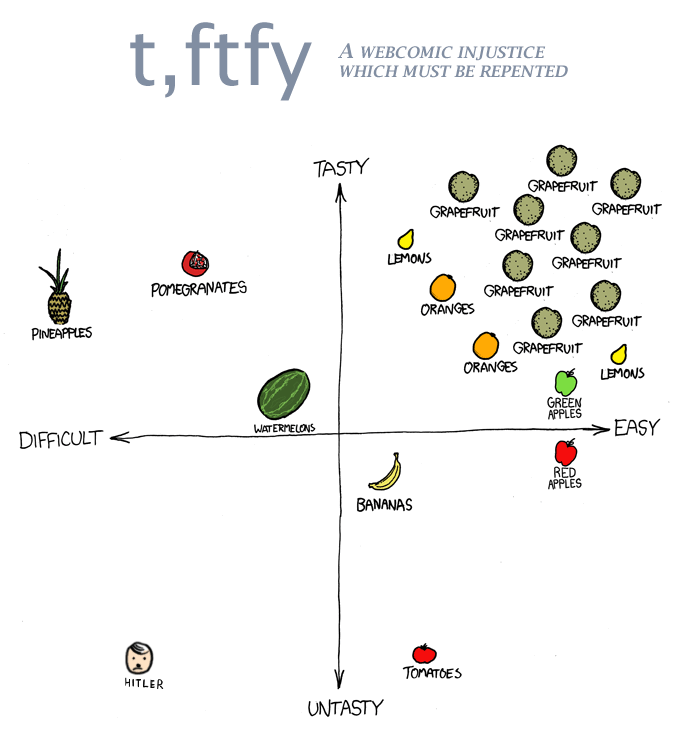 I like grapefruit quite a bit but apparently xkcd does not. Update: DieselSweetie agrees with me. Interesting article on the Great Firewall of China by James Fallows: "China's Great Firewall is crude, slapdash, and surprisingly easy to breach. Here's why it's so effective anyway." Graphical representations of the the blogosphere, social networks, and viral marketing. Getting closer to a Star Trek-like translator. "Music using ONLY sounds from Windows XP and 98!" "The real world economics of an online universe". A surprisingly good incentive for US Navy sailors. "The Truth About Sensational Kidney Thefts". The number 10^122 keeps popping up in odd places. Technology Review predicts "The 10 Emerging Technologies of 2008". Looking back on their track record for prior years' predictions, I'd say they've been mixed. Resolve your legal disputes online with VirtualCourthouse.com. Here's a video. Trailer for the new Indiana Jones movie. "HD DVD vs. Blu-ray Disc: A History"
"Does giving sweets to kids produce a 'sugar rush?'" You may be surprised at the answer. Only 30% of Americans think that nanotechnology is "morally acceptable". Dave Hill says, "this is akin to questioning whether metallurgy is morally acceptable". I've built a complete SheepShaver install, including _everything_ needed to run, as well as the last version of WordPerfect and several utilities. To download this 243mb image, go to http://groups.yahoo.com/group/wordperfectmac, to the Links section, to the "SheepShaver and Basilisk" folder, and click "SheepShaver-WordPerfect Install". It's about 20 minutes on a fast connection. I downloaded his install as well as a copy of "Strategic Conquest" from Delta Tao (purchased for $24.95), and it works like a charm! The SheepShaver software nicely emulates a Macintosh PPC running OS 7.5 with 256 colors. Google on Wednesday said it had seen 50 times more searches on Apple's iPhone than any other mobile handset, adding weight to the group’s confidence at being able to generate significant revenues from the mobile internet. "We thought it was a mistake and made our engineers check the logs again," Vic Gundotra, head of Google's mobile operations told the Financial Times at the Mobile World Congress in Barcelona. Whenever I'm out and about and I need to look up some random factoid, I frequently use my iPhone Google app. "A Q&A about Quantum Teleportation and why the effect is nothing like Star Trek". Update on the American Dream: In response to my earlier post, "Testing the American Dream", a lengthy comment thread has erupted here on QandO.net, some supporting the overall conclusion and others attacking it for a variety of reasons. Why bother with the experiment. Just go talk to immigrants. I arrived to the U.S. with a shirt on my back and spoke no English. I consider myself in the upper middle class now. This is the story that repeated itself a million time in the history of this great nation. Speaking of family obligations; both of my parents were janitors, my uncle and aunts were (and still are) janitors. My uncle and aunt is even more successful. They put three kids through medical school. "The American Dream" is a misnomer. It is not a dream. It is a reality. "The Hunting Strategies of Carnivorous Plants". [Physicist Jason] Steffen found that the worst method for boarding a plane is boarding from the front to the back, since passengers have to wait and step over each other to get to their seats. ...Quite unexpectedly, then, Steffen found that the common back-to-front boarding method is actually the second worst method possible, only slightly better than boarding front to back. ...Using a combination of a Monte Carlo optimization algorithm and intuition, Steffen determined an optimal boarding method, which could make boarding go 4 to 10 times faster than the worst method, depending on the size of the plane. In the optimal method, passengers would board 10 at a time in every other row (since loading luggage requires about two aisles of space). This way, passengers could always be boarding luggage or sitting in their seats, rather than waiting in the aisle, as in the two previous methods. However, Steffen also acknowledged that the optimal method might not be practical, since passengers who sit next to each other often travel together, and prefer to board together. He proposed a modified version, where passengers board in blocks of three consecutive seats on one side of the plane in every other row. In this strategy, there would be four boarding groups, with passengers in the same row on the same side boarding together. This method provided a decent middle ground, as it was twice as slow as the optimal method, but twice as fast as the conventional method. Although getting passengers to line up in their correct groups might sound challenging, Steffen noted that Southwest Airlines has been experimenting with having its passengers line up in numerical order -- so the logistics wouldn't be inconceivable. The main advantage of the alternative boarding methods is that they allow several passengers to load their overhead luggage simultaneously, which Steffen identified as the largest factor in determining boarding time. The merits of random boarding have been discussed here in this 2006 article. Have we learned nothing from the tragic events of 1998, when, under the watch of President Morgan Freeman, this nation was plunged into chaos, and hundreds of millions of people died at the hands of the deadly Wolf-Beiderman space rock? ..As if that is not enough, history shows us that, besides carrying the baggage of a guaranteed asteroid strike, black heads of state also give terrorists extra motivation to destroy the United States. During the presidency of 24's David Palmer, there were no fewer than four nuclear bombs smuggled into this country. That's four more than under any white president. ...Need I even mention that former President Chris Rock and his administration's slogan was "The only thing white is the house"? Though this attitude broke down the stuffiness typically associated with proper White House decorum, President Rock's laissez-faire approach not only made a mockery of the office at home, but made the United States look like a joke abroad. Testing the American Dream: Having been told that it was extremely difficult for poor people to advance up the economic ladder in America, college graduate Adam Shepard conducted an interesting experiment. He decided to start from the very bottom of the economic ladder, with "a gym bag, $25, and little else". He moved into a homeless shelter "on the wrong side of the tracks in Charleston, S.C." He set as his goal "to have a furnished apartment, a car, and $2,500 in savings within a year" without relying on his education or his former contacts. He worked his way out of poverty, found work as a day laborer, made new friends, and landed a steady job at a moving company. He had to quit his experiment after 10 months because of learning of an illness in his family, "[b]ut by then he had moved into an apartment, bought a pickup truck, and had saved close to $5,000." Clearly, this shows the crucial role that a person's character, attitude, and work ethic play in whether he is successful or not, as opposed to the exact magnitude of material resources he starts with. The full article tells more Adam Shepard's fascinating story: "Homeless: Can You Build a Life from $25?" He has also written a book about his experience, entitled, Scratch Beginnings: Me, $25, and the Search for the American Dream. It looks like his book has gotten consistently high reviews on Amazon. Update: In response to this post, a lengthy comment thread has erupted here on QandO.net, some supporting the overall conclusion and others attacking it for a variety of reasons. "Does a US penny cost more than one cent to manufacture?" "Wired Wallpaper Offers Alternative to Outlets: Philips has recently designed a type of wallpaper with conducting stripes running through it, enabling electrical devices to be hooked up to just about anywhere on the wall." Life imitates The Simpsons: Astronauts eating potato chips in zero-gravity. A professor at UC Berkeley has invented a tape-like substance that has so much adhesive strength that a person clothed in such a sticky suit could conceivably scale a building like Spider-Man. Russian mathematicians are warning that the new CERN particle accelerator in Geneva could "create a rift in the fabric of the universe" and "could open the door to visitors from the future". Women and marriage: Many people have blogged about this article on whether women should "settle" when they choose which man to marry. One question which isn't quite answered in the article is whether "settling" means compromising on core values that are genuinely important to oneself, or whether it means giving up on old priorities that one now realizes aren't really important (but may have seemed important earlier in life). Some of the points covered do fit well with this other article, "10 Reasons You Should Marry a Geek". "Orbiting Solar Panels to Shoot Energy to Earth in the Form of Laser Beams". What could possibly go wrong? Clever invention of the day: The Socket Sense expandable power strip. High speed photography is now down to the attosecond range (10^-18 sec). "Embryos created with DNA from 3 people"
"A new chip uses so little power, it could enable sensors, communication devices and other gadgets that run on body heat and movement alone." The researchers tested the mini robots on three NASA astronauts and one surgeon who were undergoing long-term training in an underwater habitat called the NASA Extreme Environment Mission Operations (NEEMO), located 20 meters underwater off the coast of Key Largo, Florida. The four "Aquanauts" received brief training on how to perform two surgeries – bowel inspection and stretch-and-dissect – and were also evaluated on how well they could perform another surgery – an appendectomy – for which they received no training. ...Another notable result was that the crew members were able to successfully perform the appendectomy, even though they had not been trained on that procedure. This success demonstrates that telementoring can be used to enable individuals trained on basic skills to build upon their skills to complete more complex procedures. "Better Than Free": Interesting article on economics in the internet era, when information dissemination is free or nearly so. ...From my study of the network economy I see roughly eight categories of intangible value that we buy when we pay for something that could be free. Programmers have created an especially difficult video game that tracks the players' eye movements and puts the bad guys where the players are least likely to look. "What Your Cellphone Says About You". And examples. You can judge for yourself if the extrapolations about owner profiles fit the color schemes. Burning questions: "Do mice fear the scent of a cat? Do mice really love cheese? Why isn't there mouse flavor cat food?" "'Across the Universe' by the Beatles will become the first song ever to be beamed directly into space next week..."
Video of the day: "Frozen Grand Central"
"Originally, we all had brown eyes", said Professor Eiberg from the Department of Cellular and Molecular Biology. "But a genetic mutation affecting the OCA2 gene in our chromosomes resulted in the creation of a 'switch', which literally 'turned off' the ability to produce brown eyes". I don't understand the appeal of munchable ice.